The other evening we dined at Sweetwater Marina and Riverdeck, which we used to own many years ago. The new owners bought Sweetwater Marina and Riverdeck from another group, so when we arrived we didn’t know them very well, although the few times we have crossed paths with them they have been incredibly warm to welcome us back, as well as genuinely excited about their new business and the many adventures they have planned for their future. They have been the “new” owners for a few years now and are just lovely whenever we see them. We couldn’t be more thrilled that they are making our former business venture such a big success. On the evening we arrived, Kim, one of the owners, immediately came over and told me she had something for me. I smiled curiously as she ran to go get the surprise. A few moments later she arrived with a small box for me. When I opened it I could not have been more surprised and touched. Not only had she happened upon this gift months ago while shopping, she had taken the time and energy to think of me (someone she really doesn’t know all that well) and purchase it! I felt like crying as I read the plaque, as if it was made just for me. 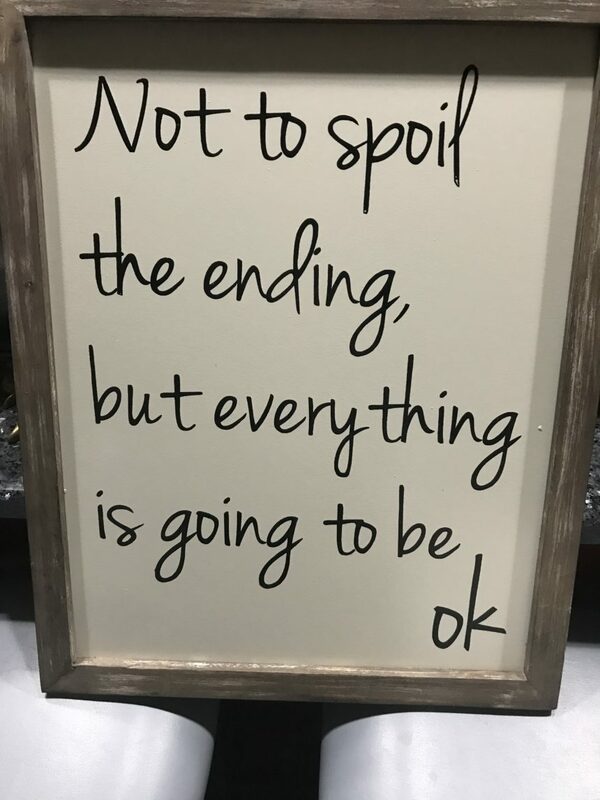 It was the name of my book and, if you will, my slogan: “Everything’s Okay.” Word’s cannot express how wonderful it is to be thought of by you, Kim. Thank you for this. I will keep this forever and think of you and your kindness every time I look at it.